Clemens Rumpf and David A. Tobin are back with a new release on Deep Village Digital Records. 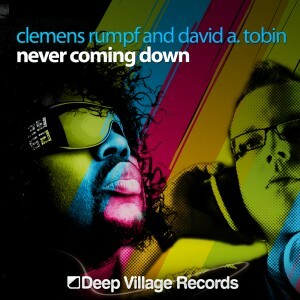 After their huge success of their album “Ain’t Nothing but House Music” (Top2 Traxsource album charts), Clemens and David return to deliver their uplifting anthem “Never Coming Down”. This time Clemens Rumpf and David A. Tobin enlisted the talents of American Gospel Maestro Lewis Young give to give the song a real authentic American freshness and the German Base Legend Grischka Zepf to hype the base line and fatten the sound till it makes you need to dance! High production level and Clemens attention to detail with the vocal talents of David A. Tobin on lead and background vocals give “Never Coming Down” a real international anthem feel! This is a must have song from the House Music team that continues to break new ground & sound. This is the one download you need in your life!